As you will see from the pictures the Dwarf Gourami is very beautiful fish, its bright colours and small size make it a popular choice for a community aquarium. They are classed as Anbantoids and like all anabantiods they have a labyrinth organ, which enables them to breathe surface air. They originate from Asia, mainly India, Pakistan and Bangladesh. Dwarf Gourami are peaceful and non aggressive which makes them good community aquarium occupants, but they can very shy, so they should be kept with other non aggressive fish, tetra and livebearer fish such as guppies are popular choice for tank mates. Males are very territorial and they will try to establish their own territory with in the aquarium. If you try to keep too many males in too small an aquarium, is likely some of males with get bullied by the others. Females are not aggressive and do not pose the same problem. Due to their shy nature they like having somewhere to hide, so caves should be provided for them. They also like live plants, they particularly like floating plants, as these provide shade and help them feel less exposed. The pH should be between 6 and 8, but ideally around 7pH . They also prefer soft water, although these fish are really adaptable. Ideally the aquarium temperature should be keep between 25 and 28C . 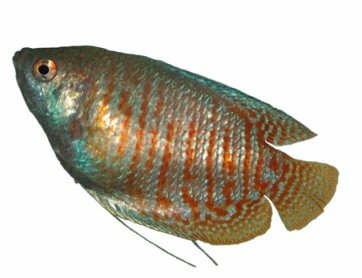 Dwarf Gourami are not fussy eaters and will accept flake food, however you may find their colours are not as bright as they should be if you only ever feed them flake. Therefore you should supplement their diet with live or frozen foods, they especially like brine shrimp and blood worms . It should be fairly easy to tell the difference between males and females, the female is much duller than the male. Like other most other Anabantoids these fish build bubble nests to breed. You should start by increasing the amount of live food you feed them. I would advise moving the breeding pair to a separate tank, so the bubble nest is not disturbed by other fish once it has been created by the male. You should include some live plants in the breeding tank, in particular floating plants. The male will use these to help him construct his bubble nest. To encourage the pair to breed you should increase the temperature slightly. In the wild they would recognise it was breeding season by the change of temperature, so you should try to mimic this in the aquarium. The male will start to build a bubble nest built of bubbles and bits of plant matter. Once he his finished building his nest he will start displaying to the female. If the female is ready to spawn she will swim under the bubble nest. If the female is not ready to spawn the male will probably become aggressive with her. If this happens you should remove the female quickly or prevent her getting hurt and killed by the male. The spawning itself will involve the male swimming around the female and turning her upside down. While upside down the female will release her eggs, the male will then fertilize them. Once fertilized he will carry the eggs to the bubble nest. They will repeat this process several times until all the eggs have been realeased, fertilized and placed in the nest. The whole procedure will take several hours and when complete there can be up to 800 eggs in the nest. When the spawning process is complete the male becomes aggressive towards the female, so she should be removed at this point. The male will guard and maintain the bubble nest. It should take around 24 hours for the eggs to hatch. Once hatched the fry will stay within the bubble nest for the first few days. When the fry start leaving the bubble nest you should remove the adult male, as he may eat his own young. The fry will be really tiny, smaller than most baby fish; therefore you need to feed them realy tiny food, such as infusoria. When they get a big bigger you can feed them brine shrimp. To make sure the fry do not get cold keep a lid on the tank.